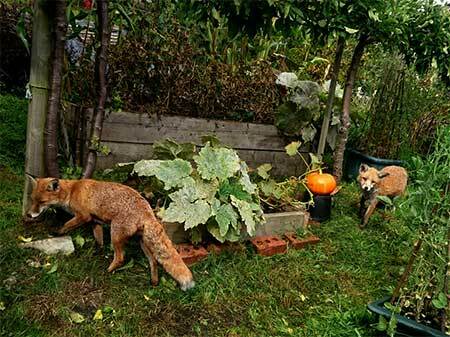 October 2018 — Breaking news — Foxes caught red-pawed! There have been reports of 'thieving foxes' at Warriston. 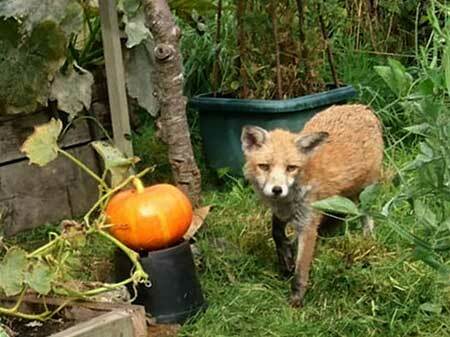 A month ago my neighbour north of my plot, told me the fox had been in his shed and taken his lunch. W'e laughed at this, but before the day was over the fox had been in my bag and taken my supper, some lamb's meat from Tesco. And last week it was in Nicola's plot with Christine's bag. The bag was rescued but the the jaffa cakes were no longer edible. Foxes, as a species, have form. A quick google will reveal evidence of worldwide activity such as the removal of golf balls from putting greens, the interception of doorstep dairy deliveries, widespread skip and bin raids and, of course, their legendary chicken hunting escapades. From all accounts given by Warriston plot holders this year, there are only a couple of foxes living with us at the moment, maybe three. So, down on the usual population of about half a dozen. But this pair/trio are making up for the drop in numbers by being ever present and in thieving mood — cheeky, uncannily tame and healthier than their relatives from previous years, they scoot under sheds with plot holder's belongings — in the past six months alone they have been sighted running off with wellies, shoes, scarves and gloves. 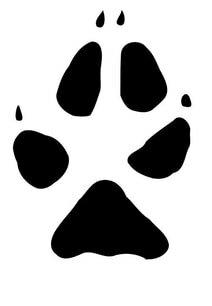 While they are very friendly and exciting to have around, do remember they are wild animals, so best to stay at a distance. And if you must feed these scavengers (which the RSPCA recommend you do not) junk or processed food will do them more harm than good. Best they keep the Warriston rats down instead. Foxes (sometimes half a dozen can be spotted at one time) are an accepted part of the Warriston scene. While they occasionally do damage to beds and seek refuge under sheds, they are fairly amicable and undemanding neighbours. 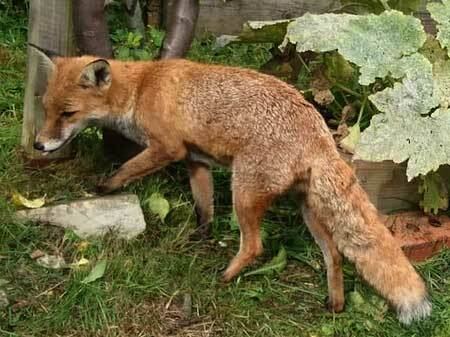 We're lucky to have such beautiful, good natured companions on our plots.